In today’s Chasing The Dream feature we look at Cubs prospect James Pugliese who was just selected in last years MLB draft. Find out how he got noticed and drafted and also what his favorie gaming system is. It might not be what you expect! For the majority of players who get drafted each year they take one of two routes. Younger, high school players bypass college and head straight to the professional ranks. These players normally stand out in high school and have some tools that scouts like. The other group of players are college players who try to improve their game and move up the ranks to potentially be a high draft pick. In today’s feature we take a look a Chicago Cubs pitching prospect James Pugliese who took a slightly different route to being drafted in the 18th round of the 2011 draft. 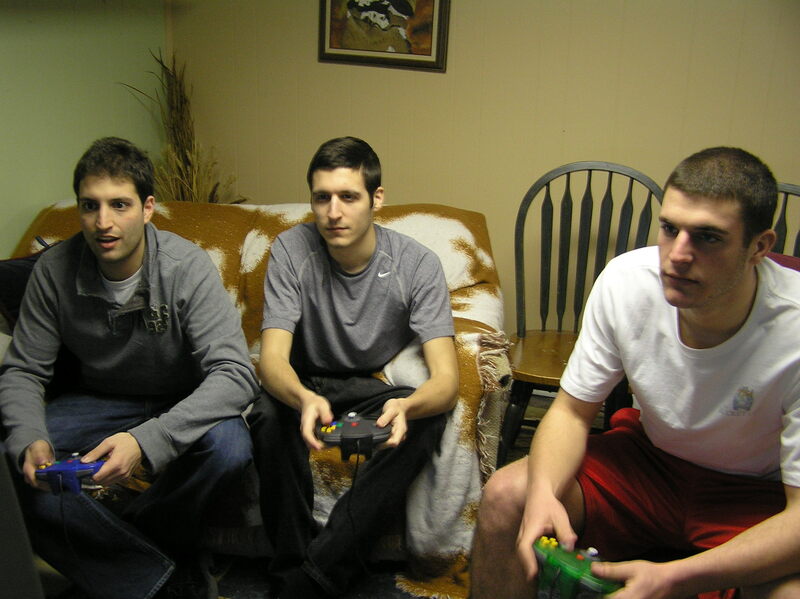 James (on the right) and his brothers prefer N64 over all the newer gaming systems. Hailing from New Jersey, Pugliese starred at Steinert high school. The right hander was not however the go to starting pitcher, he was the teams go to closer. In his final season at Steinert he was lights out with a 3-0 record and seven saves. After high school Pugliese went on to Mercer County Community College also in New Jersey. As a member of the Vikings pitching staff he transformed from a high school closer into an ace starting pitcher. During his one and only season with Mercer, Pugliese was lights out posting a 6-1 record with a low ERA of 1.27. Putting up statistics like that can easily get you noticed. As many as 15 scouts from major league teams either came to watch the righty on the mound or contacted him. It was easy to see why they had an interest in Pugliese who has a good pitchers frame and stands tall at 6’3. Although still young, Pugliese can throw up to five pitches including a knuckleball that he has tinkered with. His fast ball can also reach up to about 93 mph and all his pitches have room to grow and improve. Once the 2011 draft was over Pugliese saw himself drafted by the Chicago Cubs. He like many players did have a decision to make. He could stay at Mercer for one more year and then move on to St. Johns where he had a scholarship awaiting him or he could pack his backs and head out to Arizona to the Cubs facilities and start his journey to the majors. Pugliese decided to go with the Cubs and began living his dream as a professional baseball player. The Cubs assigned him to their rookie league squad and Pugliese was used in a variety of ways. The right hander appeared in 15 games for the Cubs. He started in nine of them, and saw some innings out of the bull pen in 6 other games. Overall he got 39 innings of work in and posted good numbers for a player appearing in the first professional games of their career. Finishing with a 2-2 record and a 4.62 era. Pugliese also fanned 32 batters while only walking 12. As we inch closer to spring training and the 2012 season Pugliese is unsure what the Cubs have in store for him. This offseason he has continued to throw and condition in preparation for the new season. In the near future he will find out his assignment and we will follow Pugliese every step of the way as he starts his first full season of professional baseball and chases his dream to the major leagues. Follow James on twitter at @Pugs51 and follow us on twitter at @CTD_Sypien for updates on our featured players and stories throughout the year. Being selected in the MLB Draft was the best feeling in the world. It felt so good to know that all of my hard work that I have done to get to that point had paid off. (But it was just the beginning). I was on the phone with scouts and I missed my name being called. Did you have any contact with scouts leading up to the draft? If so did you expect that you might end up becoming a member of the Cubs? Yes, I was in contact with 15+ different MLB teams. I had a feeling I was going to be selected by the Cubs, because the scout who drafted me told me if I didn’t get selected by another team he would call me and see if I was still interested to sign. What pitches do you throw? Which is your strongest pitch to get you out of a jam? I throw 5 different pitches. 2 Seam fastball inside for an easy ground ball. In your first season you saw time both starting and relieving which do you prefer to do and why? No matter what role I am to pitch in, I’m going to do my best to get batters out. I enjoy both equally. Is there anything in particular that cubs coaches and instructors really try to instill in young pitchers as you started and went through your 1st season in the organization? The coaches really stress Attention to Detail and staying focused. What have you done to keep yourself busy this off season? What have you done to keep yourself ready to begin the 2012 season? I work at a gym/baseball facility teaching kids about pitching mechanics and baseball in general. It’s important to give back to the community. I have a really specific lifting/throwing schedule from the organization I follow. My main goal for the upcoming 2012 season is to stay healthy, and get batters out. Favorite player growing up? Favorite non-baseball athlete? I have been reading instead lately. The book that I am reading now is called ‘The Mental Game of Baseball’ by H.A. Dorfman and Karl Kuehl. It’s a great book for baseball players or fans. I’m learning a lot and nearly all of it relates to me. I highly recommend it. PS3 or XBox? What are your top games to play? I have a xbox 360 but I don’t play it. I play Nintendo 64. The best games for it are NFL Blitz, Mario Cart, and Super Smash Brothers. A special thanks to James Pugliese for taking some time out of his off-season schedule to not only sit down and talk a little baseball with us but to share some pictures of himself on the field and off the field! Once again please give him a follow at @Pugs51 and follow us at @CTD_Sypien as we follow James and others during the 2012 season.